Hockey action from last weekend's game between City of Peterborough and Cambridge University. Photo: David Lowndes. City of Peterborough are ready for the biggest weekend in the club’s recent history. East Premier A Division leaders City travel to their main title rivals St Albans tomorrow (February 10) before hosting ace National League side Beeston in the last 16 of the English Hockey Cup at Bretton Gate on Sunday (February 11, 2pm start). City of Peterborough skipper Ross Booth (red) in action in an 8-1 win over Cambridge University. Photo: David Lowndes. The St Albans game is by far the most important of the two. St Albans are third, five points behind City, but with two games in hand. One of those matches takes place on Sunday when they travel to face a talented Bedford side. City approach the weekend in stunning form. They have scored 42 goals and conceded just one in a run of five straight wins. “We travel with confidence,” City manager Graham Finding stated. “We seem to have peaked at just the right time. We beat St Albans 2-0 at home, but they have yet to drop a point on their pitch. “We are just pleased all our hard work has paid off and we have the destiny of the title in our own hands. “We use the cup matches as a way of maintaining momentum while other clubs are playing indoors. “We have our reward now with a glamour tie against the team currently rated the second best in the country. “We played them in the semi-final and lost 5-1 two years ago, but we have progressed as a squad considerably since that match. “The cup tie will hopefully show the players what we need to do to regain and retain our national league status. The East League champions are promoted to the National League. There are currently just six points covering the top five teams. 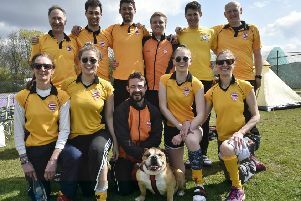 Beeston’s squad for Sunday’s game includes full Spanish, German and Chilean internationals, plus a host of Great Britain and England internationals. The City squad for the weekend is: Cameron Goodey, Ross Booth (captain), Joe Finding, Ben Newman, Henry Ricketts, Alex Armstrong, Ben Read, Ross Ambler, Danny Sisson, Adam Wilson, Jordan Heald, Brendan Andrews, Nathan Foad, Manish Patel, George Warrender, Nathan Rozario, James Fisher. There’s also a big game for City of Peterborough Ladies tomorrow (1pm) when they host Wapping in the East Premier Division. City collected the team of the year prize at the Peterborough Telegraph Sports Awards last week, but lost 2-1 at St Albans seconds the following day to lose top spot in the table to Ipswich. City are second, while Wapping are third. Bourne Deeping Hockey Club are enjoying a fine season with three teams sitting top of East League tables. The men’s second team jumped up three places to first after an 8-0 win over Spalding thirds with Harry Fontaine scoring four times. Bourne Deeping Ladies first team stayed top of Division Three North West as mother and daughter Sue and Izzie Oakley scored in a 2-1 win over Ely and the ladies seconds won a key game at City of Peterborough fourths to remain at the head of Division Four North West. Kirsty Martin and Sara Morgan-Walters scored in a 2-0 success.